Alot of you who read my blog may have known me for many years. Others not so long but no matter how long you may or may not have known me I have some exciting personal news I wanted to share..Some of you may understand and some may not, but I still wanted to share my happiness with you regardless..
and Blessed Mother Theresa of Kalkuta. (Yes thats how it's actually spelled) I could go into hundreds of reason why I love both of these people but it would take to long so for now I will stick with Blessed Mother Theresa. Blessed Mother Theresa, as most of us believe was a living Saint without having to be officially declared one through the Church but that is also underway. She loved all people of all faiths, of all colors. But most especially, she loved, the Poorest of the Poor, the sick, the dying, the unwanted and the unloved. 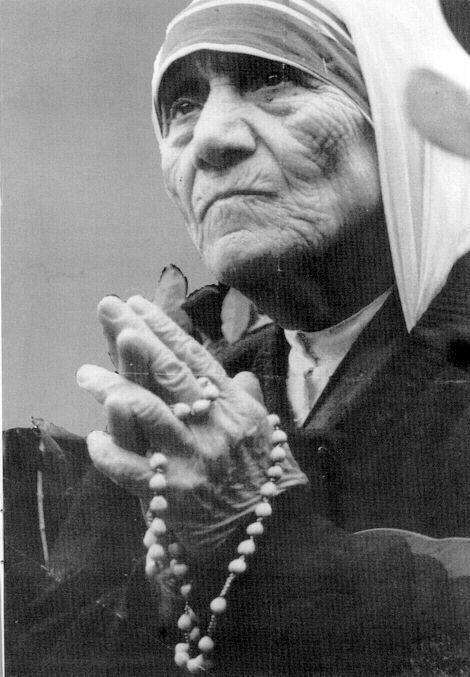 She gave her entire life in service to these kinds of people out of her love for Christ..If you have not read about or do not know about Blessed Mother Theresa and The Work she did I highly suggest you do some reading..Her love for these people and our Lord is something that can not be grown over time, it's a gift from God Himself. Anyway, She started an order called The Missionaries of Charity many many years ago. 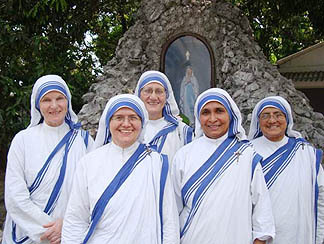 To learn more about them please visit their website and learn about The Work and Blessed Mother Theresa. I myself have wanted for a long time to be part of the Missionaries of Charity but for a few reasons it isn't possible. Firstly, because I am married, secondly because I am not in good health. I thought of sending a monthly donation to help with The Work but they do not accept money and I don't really have any to send so what could I do? I let the idea go and just sit in the back of my mind. About a week ago I contact the Missionaries of Charity in India to inquire about obtaining a relic of Blessed Mother Theresa. In swapping emails with Sister Ignacia of the Missionaries of Charity we exchanged some personal information including about my health. That was the last email we sent and I hadn't heard back since last week. Well last night Sister Ignacia wrote me back and I could have never expected what she asked me... Sister wanted to know if I would like to join what is called the "Sick and Suffering Co-Workers of the Missionaries of Charity!. 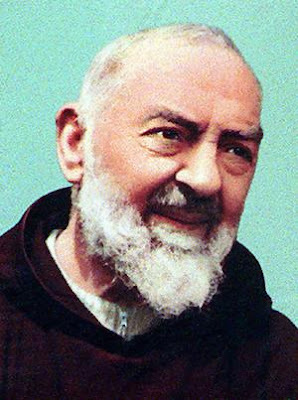 What that means is, I will have one particular sister of the Missionaries of Charity assigned to me and I will be assigned to her. We will pray for each other daily.. Mother stared this extended order many years ago and she used to call her own personal Sick and Suffering Co-Worker "her other self".. Spiritually we become one praying each day and offering up to God our sufferings for the good of each other and the work we each do as pertains to our vocation in life, for the good of each others soul and body. I will not have to take the official vows of a sister of the Missionaries of Charity but I will take a vow to pray daily for "my other self".. So I just wanted to share some of my joy with you that has been overflowing in my heart since I read the email last night..I hope you will take some time to visit the links within this post and learn more about Blessed Mother Theresa, her Missionaries of Charity and The Work... It's truly an amazing work of God.. All of it.. This was very touching to me. I am a great admirer of Mother Teresa and her great legacy.